You are not logged in. 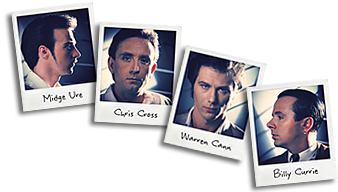 [Log In] Ultravox.org.uk » Forums » Music » Ultravox » Love's Great Adventure, track 9 of "Lament"? #100792 - Wed, 15 Feb 2017 20:10:55 Love's Great Adventure, track 9 of "Lament"? Always wondered why "Lament" was so short and only 8 tracks (when every other UV album of that era had 9) - was LGA meant for "Lament" and taken off as they knew a greatest hits was imminent or was it only created for the latter? If I remember correctly, it started life as a rejected idea for a second Levis advert. I suspect that only releasing LGA as a single and then including it on the Collection compilation album did wonders for sales of that album as well. Can remember the first reunion concert a few years ago and I was quite disappointed that they didn't play LGA although they did include it in the concerts the following year. Was quite surprised it was left off the list but remember hearing something about the band not liking the track. Not sure if that's true or not. Record companies like to have an extra track or two on greatest hits albums for that very reason. They wouldn't have played it if they didn't like it. Their criterion for choosing the songs tom play was whether they actually wanted to play them or not. They each rated all their songs according to whether they strongly wanted to play them, didn't mind playing them, would play them if forced, or really didn't want to. Any songs in the last category weren't played. Midge often plays LGA in his solo shows, and I seem to remember him playing it during Something from Everything, so he definitely likes it. I seem to recall reading comments from Midge sometime, somewhere, that when Chrysalis suggested the release of a 'greatest hits' album, that the band decided to record a new track (i.e. Love's Great Adventure) as a single for the compilation album. I think Midge may also have suggested that this was the start of the trend for bands releasing a new single in support of 'best of' albums. An example of more Ultravox innovation, perhaps? Is it actually correct? I remember "Under Pressure" being added to Queen's first "Greatest Hits" as the most recent hit - and that was in 1981. There are probably some more examples of that. Because it's a really big claim, I think, and if it's correct then wow! Actually 8 tracks per album is not an unusual thing for the 1980s and such records weren't considered short - just albums with longer songs. As for LGA being a part of Lament - well, for a start it's so different in mood and execution that there's no question about it. It originated as a second advert for Levi's jeans called "Threads" but was rejected by the company. Some time later it was used to promote "The Collection". I'm also not sure it had such a crucial role in the compilation's success - after all, Ultravox were already very established band respected by the public and their official singles compilation would've had the same success even without a new song. Moreover, it may be because of the compilation's success that the single didn't quite hit as big as was hoped for.